The 2018-19 English Premier League season kicked off over the weekend, with the promoted teams, some big spenders and the usual suspects keen to gauge where they stood. Chelsea and Manchester City cruised through their opening matches, against Huddersfield and Arsenal respectively, while Tottenham Hotspur and Manchester United also took three points on the opening day. Paul Pogba had the privilege of opening the scoring as the Red Devils accounted for Leicester City at Old Trafford and Watford, Crystal Palace and Bournemouth all began the season with wins. Sunday threw up a clash between two clubs that opened their purse strings over the off-season in the hopes of a change in fortunes. Despite a fourth-place finish last season, the 25-point discrepancy between Manchester City and Liverpool was unsustainable if the Reds hope to return to the glory days. Now an elitist competition, Liverpool fans expect the club to be an annual challenger for the league – or else. West Ham United are a completely different kettle of fish. After slipping to well within the grasp of the evil serpent that is relegation, the Irons managed a late-season surge to eventually climb to 13th. The season mirrored others of recent decades and fuelled the fires of frustration. As fans demanded answers, they rather aggressively began to take matters into their own hands. Investment and change was needed and, with money to spend, they called for new blood. Managers have been the recent scapegoats. With one of the club’s favourite sons, Slaven Bilic, already having ridden into the managerial sunset after his exit in 2017, David Moyes had also appeared on a hiding to nothing when he took the reins soon after. The season just past began horribly and only improved marginally, but a contender the Hammers were not. Enter new gaffer Manuel Pellegrini and a host of recruits – worth around £100 million – and the fans have their wish. Felipe Anderson, Issa Diop, Andriy Yarmolenko and Jack Wilshere were significant acquisitions and with a total of nine new men on the books, West Ham could not be accused of withholding the tools Pellegrini feels he needs to compete. Sunday saw the debut of five new players as West Ham faced Liverpool at Anfield. It was a 4-0 rout in favour of the home team. Despite Lukasz Fabianski looking solid in goal, the remainder of the new signings did little of note. Fabian Balbuena made fundamental errors in defence and Wilshere and Ryan Fredericks failed to have a significant impact. Felipe Anderson produced a solid performance, yet it was difficult for any West Ham player to impress considering the lop-sided nature of the contest. With much positive talk around the hopes of the Hammers, they may have overlooked the Reds’ own spending spree. The £67 million spent on new ‘keeper Alisson Becker reflects just how important Jurgen Klopp saw a strengthening between the sticks. 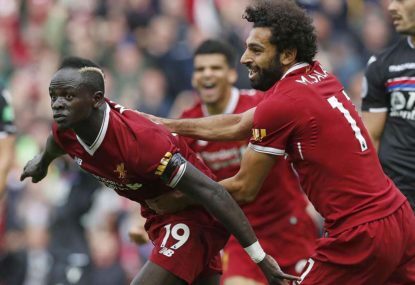 Throw in Naby Keita, Fabinho and Xherdan Shaqiri to an already star-studded squad – including Roberto Firmino, Sadio Mane and Mohamed Salah – and Liverpool are realistic challengers to City this campaign. A further £150 million invested into a team that was already capable of reaching the Champions League final is an ominous sign. West Ham were humiliated and Salah picked up exactly where he had left off. Claiming 32 goals in a Premier League season was an insane return for the Egyptian, yet with new, expensive and quality providers looking to tee him up, the chances of an encore performance look strong. It loomed as one of the potential matches of the round and ended in a smorgasbord of goals for the home side, providing clear evidence that West Ham, with all the changes made over the summer, will need some time to gel. Week 2 presents their chance for redemption when they tackle Bournemouth, while Crystal Palace will have their hands full combating a confident Liverpool that are looking to set the early pace in the championship race. The match of the round will be Chelsea at home to Arsenal, with the Gunners desperate for a result after a loss to Manchester City on the opening weekend. In terms of the draw, it has certainly been a baptism of fire for Arsenal and another loss would see them rattled early in the season.